If you’ve seen one market you’ve seen them all…WRONG! The Maeklong train market is one of the most unique markets in all of Asia. 3 days in Bangkok should include a little shopping trip to the train market Bangkok. On our Thailand honeymoon we made a day trip from Bangkok to check out this market for ourselves. What Is The Maeklong Train Market? The train market, as the name suggests, is built around a railroad line. The name Maeklong railway market literally means “umbrella pulldown market” (once you visit the market you’ll know why). Locally the market is known as Talat Rom Hoop (ตลาดร่มหุบ). The railway became famous for its route through the Maeklong Railway Market. The train runs right through the market several times a day. As soon as the vendors hear a train coming they quickly take down their awning over their goods. It’s an amazing sight to watch, the vendors move so quickly and the train passes literally inches from the goods in the market. Within seconds, everything is back to business at the train market. Where Is The Train Market Bangkok? The easiest way to visit train market is by car. But, I would never suggest renting a car in Bangkok and driving yourself. Hire a private driver for a day and tie in several other attractions outside of Bangkok. There are also several tour operators that run a trip to the train market from Bangkok. If you want to organize visiting the train market on your own, the Maeklong train market is easily accessible from Bangkok by train. Take the Skytrain to Victory Monument station, and catch the van service from here right to the train market Bangkok. Just ask for the Maeklong train market van. When Is The Train Market Open? The train market is open daily 6:20am-5:40pm. I advise visiting the train market early in the morning. The temperature will be much more comfortable and the vendors will have the best selections. What Is For Sale At The Bangkok Train Market? Currently, the market is predominantly a food market, filled with all kinds of exotic edibles. We toured around the many stalls eating our way through the seemingly endless aisles of vendors. The train market is one of the largest fresh seafood markets in Thailand. When Does The Train Go Through The Train Market? A warning bell goes off over a loud-speaker system a few minutes before an approaching train. You won’t miss it, it’s super loud! This gives the vendors just enough time to take down their awnings and remove their goods from the train tracks. The train runs through the Bangkok train market 7 times a day 7 days a week. It is difficult to time exactly when as times are subject to change. It’s best to check the updated train schedule which is displayed at the Maeklong Railway station nearby the train market. Our trip to the Maeklong train market is still one of our favorite markets in the world. We recommend everyone to visit the train market Bangkok, as it such a great day trip to take from Bangkok. 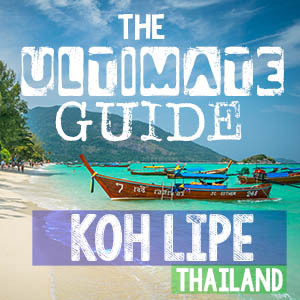 If you’re looking for another interesting market check out the Bangkok flower market, we promise it smells much nicer than the Maeklong train market and if you want to get away from all the hustle and bustle check out one of the best beaches anywhere at Koh Lipe. Make sure to check out guide to where to stay in Bangkok to decide what area of Bangkok is best for you. Have you been to a train market before? Regarding the meeklong railway market ,just how easy is it to do on your own from Bangkok and how much did it cost etc. I realise prices will have gone up , i just want an idea so i can compare it with a tour . We hired a driver for the day to bring us to the market from our Bangkok hotel. Prices for drivers are super reasonable. Nope it should be open every day! Hope you time your visit with a train passing thru. Safe travels! hi is the market only open for the weekend? I need to go here. Maybe this Sunday! Hope you made it to the Makelong Train market and had a blast! The train line was closed when we got there March 24 🙁 But has re-opened again on 1st April after a long maintenance. Cheers for that! I’m planning on going there very soon. I read the train line was closed six months last year. I just wonder if the line is open again? The market is open, but the train schedules can be harder to find. However, during the day trains do run through regularly. Plan enough time to make sure you see the train come through, it’s a sight to see! I had never heard of Maeklong Train Market – like many travelers, I’m familiar with Chatuchak Weekend Market (I like that place a lot). I’ve never been to a train market but Maeklong looks fun. Did you try anything there? It’s way different than the weekend market in Bangkok, which is a must in Bangkok! If you have time def check out the train market, or if you find yourself in Bangkok during the week and therefore the weekend market not open. Adam tried SEVERAL things like usual.